DiploMom and I got started this week on the immunizations that we will need for Guatemala City by visiting the health unit at FSI. We don’t need to get too many, mainly Hep A/B, which is administered in a series of three shots and one for typhoid. Rabies is recommended as well, but there is currently a major shortage, so if we want to get that one, we’ll likely need to do so once we are already in country. Guatemala City is at a high enough elevation that there is no concern for malaria, which is really great, since we won’t have to worry with taking daily pills, that many times have some unpleasant side effects. After two years of wondering and endless speculation of where we would be assigned if this whole Foreign Service process continued moving forward, we finally arrived at Flag Day. I felt pretty relaxed waiting for things to kick off, as DiploMom and I felt fairly certain that we would receive one of our high bids. 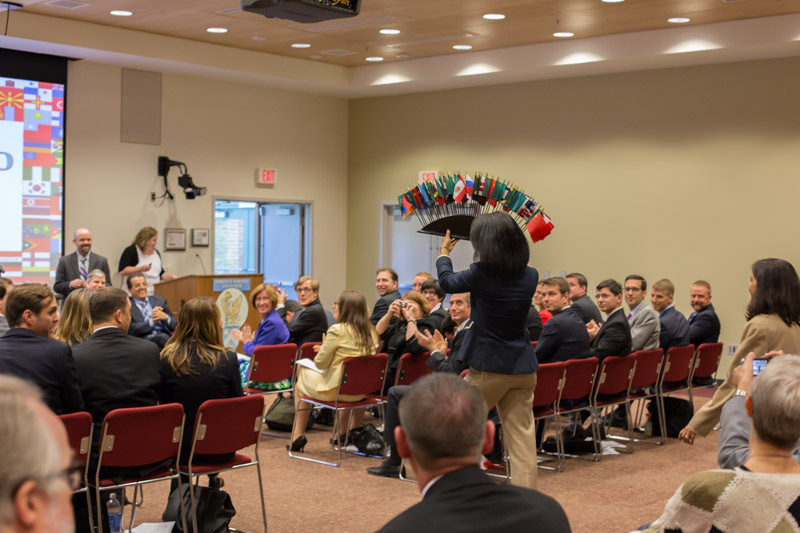 That relaxed feeling quickly disappeared as all the flags were brought into the room and the ceremony commenced. My pulse quickened and my mouth got a bit drier. We were about to find out where we would be living for the next two years – would it be what we were hoping for, or were we going to get a curve ball? Thankfully the introductory remarks were very brief and we moved straight away into the post assignments. Class member names are not called alphabetically, so we had no idea when DiploMom would be called. With each post, the country flag would appear on the screen and then the person’s name and city would be announced. 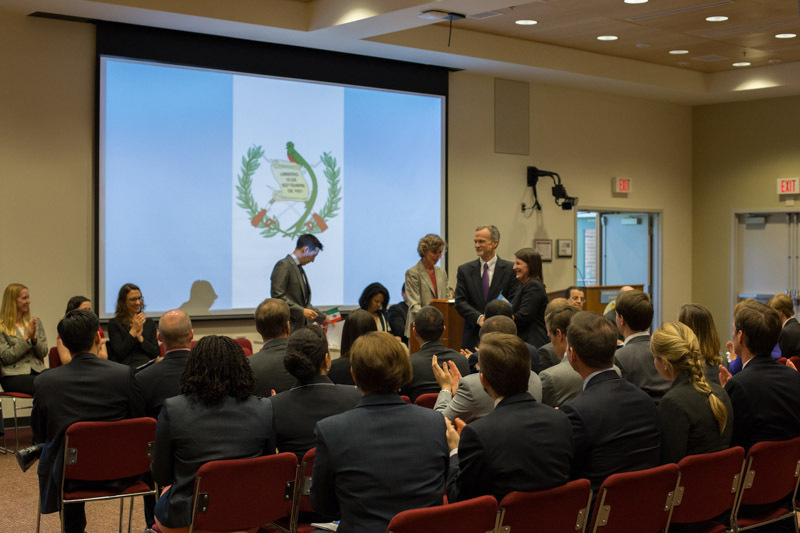 Relatively quickly, the Guatemalan flag appeared, but DiploMom’s name was not called. I was surprised at who was called, until I remembered that there were two posts to Guatemala City, one relatively soon and the other not until January, which gave time for language training. So far so good, we still had our high bids available. There were quite a few posts in Mexico, especially on the border, so I held my breath each time the Mexican flag appeared on the screen. The Colombian flag appeared. Bogota was a high bid for us. Another name was called. Check that one off. Later, another Mexican flag, but this time for Guadalajara, another of our high bids. Another name called. At this point I was feeling pretty good that it would be Guatemala City, but I was still nervous there might be a curve ball. 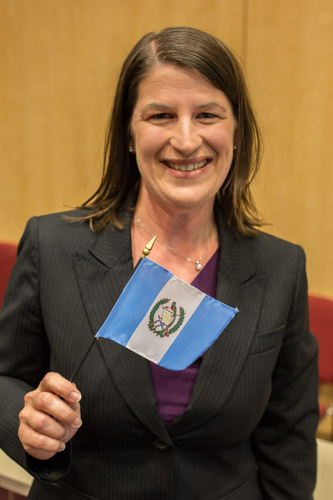 Finally the Guatemalan flag appeared again and I stopped breathing. DiploMom’s name was called. Sweet relief! So we’re headed to Guatemala City, and we are thrilled. It is great to finally know so that we can get ready for this next step. Since DiploMom already speaks Spanish, we’ll be headed out sometime in July after she finishes her other training classes. 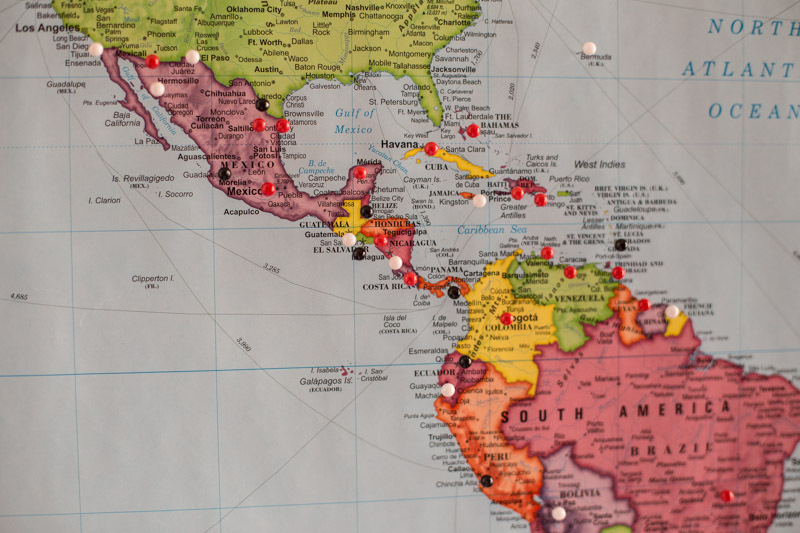 We’ve met some other families here at the Oakwood who will be moving to Guatemala City this summer as well, so we are glad that we will already know some families who will be transitioning around the same time. We’re headed to Guatemala City. More details on Flag Day to come in the next post. 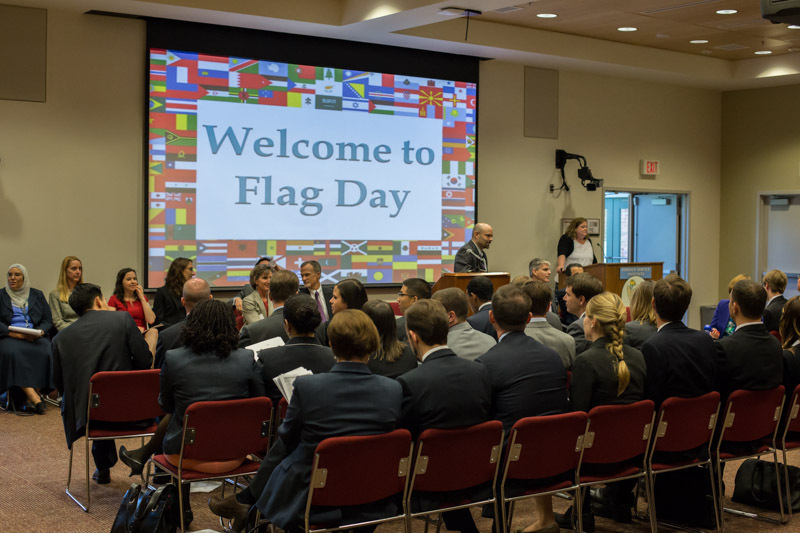 This coming Friday is the Flag Day ceremony, where everyone in DiploMom’s A-100 training class will receive their post assignments. As I am feeling more settled in here at the Oakwood, and getting into a pretty good routine with DiploTot, I have to remind myself that this current setup is just temporary and that we will ultimately be moving again, but this time out of the country to foreign lands. Considering the huge impact that our post assignment will have on our lives for the next two years, I feel remarkable calm leading up to the big day. I am sure my anxiety level will increase as we get closer to Friday, but I feel relatively good about our “chances” to end up in one of the several posts that we bid high. There is, of course, always the possibility of a curve ball, but I think those odds are a bit lower, given my understanding of the situation. Needless to say, we’re both excited to find out where we will be headed and we are anxious to start planning and preparing for this next big step. Stay tuned for the big announcement. DiploMom and I had a great meeting with her assigned Career Development Officer (CDO) today in D.C. The CDOs meet with members of the A-100 class to discuss career objectives, answer questions about the post bidding process, and help with any other issues that arise. They also determine all of the post assignments, putting together the puzzle that comprises post preferences from all class members, while taking into account the needs of State in determining who goes where. So needless to say, our CDO will have a huge impact on our lives for the next couple of years. Our bid list is due next week and we have a pretty good idea of how our preferences will map out, so once we submit, then we get to anxiously wait for Flag Day, where all of the post assignments will be announced. Beyond the anticipation of DiploMom receiving an invite to an A-100 class, the next biggest question was what our post options would be. She received the bid list today and we feel really good about what is available. We’ll know where we are being sent at the Flag Day ceremony, so the next step is researching the options and ranking our preferences. It is crazy to think that after all the waiting, we’ll finally know where we will be posted for the next two years by the end of April.